If you have any Italian friends, chances are you’ve heard of Briscola. This highly-addictive, somewhat shrewd but still very enjoyable card game is played with a 40-card deck, with a number of different variations offering subtle rule differences. The basic version, the more popular of the variants, has four players broken up unto two teams of two, battling against each other in a trick-taking game of wits and skill. The deck must be shuffled before any cards are dealt. Each player is dealt three cards each, with the next card placed face up on the playing surface, generally next to the remaining deck. This is the trump suit for the game — or the “Briscola” card. If any player has the Briscola card, they must retire the card before the beginning of the game, but this can’t be done once the game begins. Teams are also permitted to share their hands with each team member. Both the deal and the game are played counter-clockwise, with the player to the right of the dealer leading the trick. They do this by playing one card face up on the playing surface, at which point each player has to play a card in turn, until each player has only one card remaining. There are also three face-value cards in each suit: the Knave (Fante in Italian), the Knight (Cavallo) and the King (Re). The cards listed above range in value from one through to seven, depending on the face value and number of symbols appearing on the card. Combined, a single deck should equate to 120 points, with players aiming to have a higher score at the end of the round than all other players. Occasionally, the two teams can both end up on 60, which requires a rematch. If trump card has been played, the player/team with the highest trump valued card wins. If no trump card has been played, it is the player/team with the highest card of the lead suit that wins. Once the winner of the trick has been determined, the winning player must collect all of the played cards and place them face down in a pile on the playing surface. Each player must maintain their own pile. Once this is done, each player grabs a card from the remaining deck – starting with the trick winner – heading counter-clockwise. 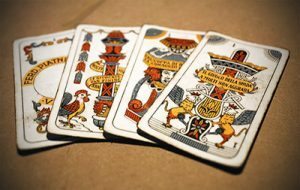 Any player who draws a card with the seven of trump can take the briscola, but it can only be done if the player has won a single hand beforehand. Once all of the cards have been played, players calculate the point value of their pile to determine the winner of the match.